Puzzle Pirates Forums - View Thread - [Closed][Survey] Win a black/black armor with spear! Forums » List all forums » Forum: Cobalt Events » Thread: [Closed][Survey] Win a black/black armor with spear! [Closed][Survey] Win a black/black armor with spear! I am in the need of some survey results and I can't think of any better way then to offer a reward to those who take it! From now until the 24th of this month, a survey will be open and posted here. Each pirate that completes the survey will be in a drawing to win one of three black/black armor with spear furniture items (in new condition). Disclaimer: Due to the limited abilities of Zoomerang, only 100 pirates will be able to take the survey. Please do not try to take the survey more than once, as Zoomerang will not let you. Thank you to the 100 pirates that took the survey. Armor winners will be posted shortly. Re: [Survey] Win a black/black armor with spear! That was pretty interesting thanks for setting that up. So far we've had 26 surveys answered. There are a lot of differing answers, but definately some answers are more popular than others. There are only 8 days left and 74 surveys left, whichever comes first will end the survey. I hope this isn't a bad question but was wondering how the [specific question] answers are going? I found that to be the hardest but all together was pretty good. If you want me to I can erase this by not giving a question away..
Well will we see the power of 10 as ye next game? I had thought about doing it myself. Actually, I am not doing a "Power of 10" game. I know that there is someone on Midnight doing that, but I am doing a gameshow. Family Feud, or as my version is called, Flag Feud! Well I took the survey but I am pretty sure Gilligan's isn't an island on ice. I didn't feel like logging onto ice to get a name. Each pirate that completes the survey will be in a drawing to win one of three black/black armor with spear furniture items (in new condition). Aye, all 100 pirates surveyed will have equal chance to win one of the three armors. And there are only 22 surveys left! Seamyst tells ye, "wake up and go to sleep rofl." Avatar by the 1337 Osaka. Just 9 more surveys to go! Re: [Closed][Survey] Win a black/black armor with spear! Okay, all 100 surveys have been completed. A big thank you to everyone who participated! 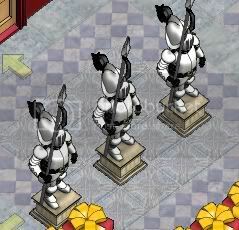 The three lucky pirates that will be chosen for the armors will be posted soon. There is no score. Its a survey so there is no right or wrong answers. I would just like to say another big thank you to everyone who participated in the survey. If the first "Flag Feud" is a success, you can expect more surveys with more prizes to be drawn. All three of you can contact me in-game to pick up your black/black armor with spear! Lmfao Freak thanks.. I am pretty sure a question that says name an island on ice and you put Ice is something you make from water it isnt a game.. That is wrong survey or not.. My 02 cents though..